why she not re-published her Book again ? And both those ppl, the Beatle and the author of Waiting For The Beatles, are now dead, and GH would probably say That's the way it goes. They have become part of a lost world. One day someone is full of life, and another day gone forever. There's something unbelievable about that, even though it happens everyday all over the world, and grief has to deal with that unbelievability. Not denial. Just incredible. What fascinates me is that back then you could just go and ring the doorbell at a Beatle's house and he would answer. Sara: As you know, I knew Carol Bedford (who also hailed from Dallas) and, as you recall, I have the original American edition of the Hunter Davies bio that Carol got signed by all four Beatles in 1969 -- George at home around Easter, and the other three on the steps of EMI Abbey Road Studios during the summer of '69. 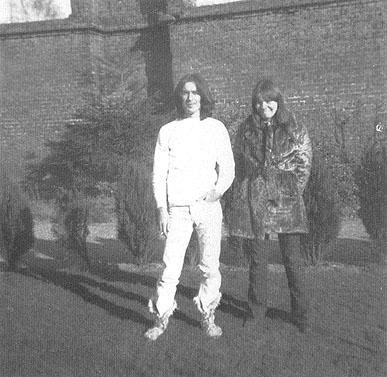 This photo of Carol with George was taken during that Easter visit to Kinfauns, and this is the day that she got George to sign the book I now have (and have had) since 1987.